By default, the transition is a dissolve, but you can easily change it to an edge or clock wipe by selecting the transition, and either double-clicking it or changing it in the Panel view. In the Timeline or Thumbnails view, select the transition. 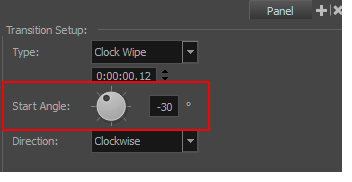 In the Panel view, select Edge Wipe, Clock Wipe or Dissolve from the Type menu. In the Timeline view, double-click the selected transition in the Timeline view to change the transition type between Dissolve, Edge Wipe, and Clock Wipe. In the Timeline or Thumbnails view, select the Clock Wipe transition. Type in a value in the text field. In the Direction menu, select the wipe direction: Clockwise or Counterclockwise.